Last year's LG G5 didn't do so hot, largely owing to its embarrassing build quality and poorly-executed modularity push. Judging from this latest leaked image, the Korean tech giant is looking to correct the mistakes it made with the upcoming G6. This shot, courtesy of The Verge, is the sole image we currently have of the phone. Although we can only see the top half of the it, there's still a decent amount of gleanable information. It appears that LG has abandoned its dream of creating an antenna band-less phone, considering the metallic shine on the chassis and the visible antenna bands on the top of the device. More interestingly, the screen has rounded corners. Most recently, we saw this idea on Xiaomi's daring Mi MIX, but it's also been rumored to be on Samsung's upcoming Galaxy S8. Display purists will likely take offense to this, but it's an interesting design element nonetheless. However, other than the extra curves around the screen, the design seems fairly generic. The curved metal chassis and chamfers are nothing we haven't seen before, and the sensor arrangement appears to be pretty standard as well. It is worth noting that the top bezel is very minimal, with the bottom one just a bit bigger, both of which allow the G6 to have a screen-to-bezel ratio of over 90%. Impressive, to say the least. 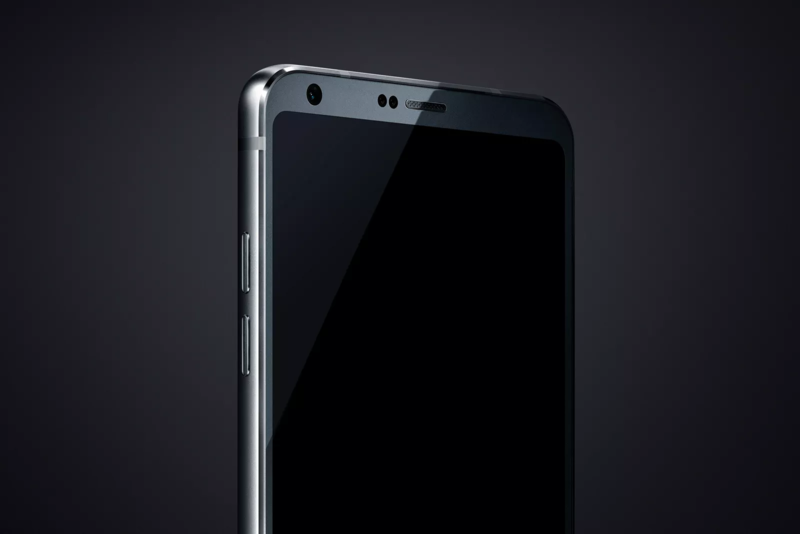 Previously, we reported on renders of the G6 being made available. As it has done in the past, LG has been slowly trickling information on the phone, with tidbits such as a 5.7-inch 1440p display with a 2:1 aspect ratio (I refuse to call it 18:9) and the possibility of water resistance. It's also been rumored that the G6 will not have a user-replaceable battery, and that it will be the first non-Pixel phone with Google Assistant out of the box. Given the high-res, revealing, yet somewhat cryptic nature of this latest photo, we wouldn't be surprised to learn that this is another one of LG's antics. We're (hopefully) going to see more than the top half of the G6 at MWC on February 26th.